A Samsung Galaxy S2 smartphone has allegedly combusted in a user's pocket, just days after an iPhone 4 handset had to be 'extinguished' on an aeroplane. The Galaxy S2 user reportedly heard a sound before feeling a burning sensation in his trouser region (which in our experience usually requires a trip to 'the clinic'). When he pulled the top-level Android phone out of his pocket it was smoking, claims a friend who posted pictures of the charred remnants of the two-week old phone on the XDA Developers' forum. "My friend almost lost his nuts! He said he heard a sound, [felt] a burning sensation on his leg and as he pulled this piece of junk out of his pocket he smelled burning," posted Silly22. "There was smoke coming out of his pocket and out of the phone. He said he was scared. 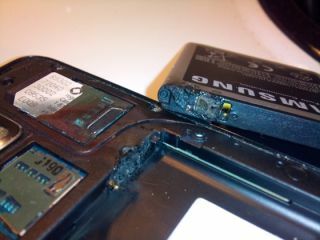 "My friend didn't even own this phone for two weeks before it nearly burned him! He said he wasn't even using it; [it was] just idling in his pocket and [he]hadn't been used for a while." The spontaneous combustion comes in the same week that an iPhone 4 handset began "smoking" and "glowing red" during landing on a plane in Australia. We know Apple has accused Samsung of copying the iPhone 4 in a series of lawsuits, but surely this is taking it a bit far?